There is a salad on our table almost every single night. Usually it’s lettuce. More often than not, just a bowl of slivered romaine with a tart vinaigrette. Super simple. 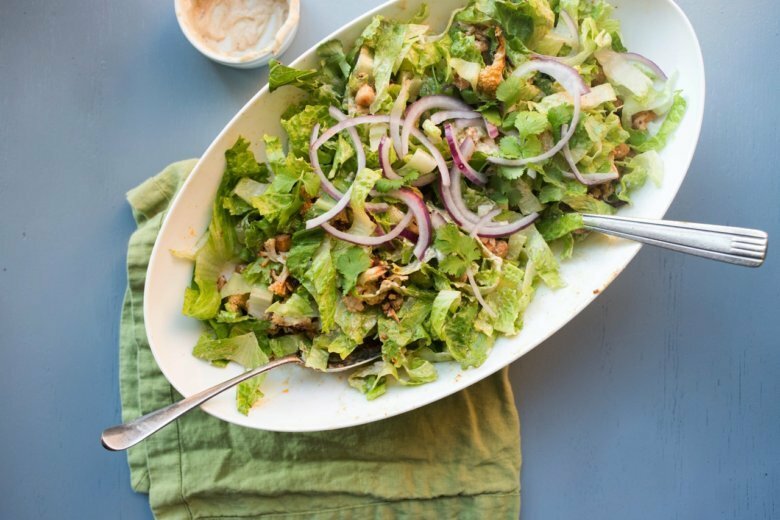 The lemon tahini dressing easily partners with the chickpeas — collectively, they are basically the ingredients in traditional hummus. The dressing is thick, almost mayonnaise-like in texture. At first you’ll basically dollop it on, but then when you toss the vegetables and lettuce with the dressing it will coat everything with creaminess. And because we just love lettuce, a whole pile of thinly sliced romaine hearts provides the crunch against the tenderness of the roasted vegetables. A shower of thinly sliced red onion is the kicker, plus some herby brightness from cilantro or parsley. Choose between the two, or use a combo for yet another layer of flavor. On an average weeknight this will probably not be our side salad. But it is likely to show up the next time I’m making a big meal with a Mediterranean or Middle Eastern bent, as the show-off salad that threatens to upstage the main dish. And I will secretly hope it doesn’t all get eaten, and that there will be a container nestled in the back of the fridge for my lunch the next day. Preheat the oven to 400 F. Place the cauliflower on a rimmed baking sheet. Drizzle over it 2 tablespoons of the olive oil, sprinkle with the paprika, 1/2 teaspoon cumin, and cayenne, and season with salt and pepper. Use a spoon or your hands to toss everything until the cauliflower is well coated with the seasoned oil. Roast for 20 minutes until the cauliflower is starting to soften, then add the chickpeas to the pan, use a spoon to stir so they are evenly distributed and coated with the seasoned oil. Roast for another 15 minutes, until the chickpeas have firmed up a bit (they will get firmer as they cool) and the cauliflower is nicely browned and a little crisped at some of the edges. Let cool to slightly warm or room temperature. Meanwhile, make the dressing. Place the tahini, water, remaining 2 tablespoons olive oil, lemon juice, garlic, remaining 1/2 teaspoon cumin, and salt and pepper in a food processor or a blender, and process until thick and smooth. You can also combine all the ingredients in a container or bowl and shake or stir to blend well. Nutrition information per serving: 187 calories; 112 calories from fat; 13 g fat (2 g saturated; 0 g trans fats); 0 mg cholesterol; 168 mg sodium; 15 g carbohydrate; 5 g fiber; 4 g sugar; 6 g protein.